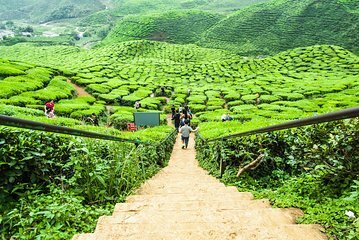 Genießen Sie die Flexibilität des unabhängigen Reisens, ohne sich auf dieser privaten Tour durch die Cameron Highlands von Haus zu Haus zu begeben. Nach einem kurzen Stopp am Wasserfall Lata Iskandar und einem indigenen Dorf besuchen Sie Teeplantagen, Blumengärten, eine Erdbeerfarm, eine Kaktusfarm, Gemüsegärten oder den Sam Poh Tempel. Beautiful places, I definitely recommend to visit. But if you can don't take this tour. Is around 3-4 hours drive from KL on mountain roads. Our driver was rushing and drive wasn't comfortable and in my opinion not safe. He was also rushing back. So at the end 11 hours tour - 7 hours in the car, 1 hour for lunch, not much time to expirience highland. It was a three hour drive by private car to get there. The last hour is on a very very winding road up the mountain. The driver was amazing and took the road like a pro -- my wife not so much. She got car sick on the way. When we finally arrived in the Highlands it was well worth the effort. The tea plantation was very interesting to see. You were able to walk thru the factory to see how the tea was processed. The driver/guide made several interesting stops on the way back at a butterfly museum and at a antique museum -- both of which were very interesting. Only negative was the car smelled of cigarette smoke.